Reporter Dan Ronan dismissed from Belo8. Says, "I think things will be fine"
Belo8 reporter Dan Ronan has been dropped by the station and left the newsroom early Wednesday morning. News director Mike Valentine confirmed Ronan's dismissal later Wednesday, but said he would have no further comment. Ronan, reached at mid-afternoon Wednesday, said, "Maybe it's time for a change in my life. We were all in agreement on that." Ronan, 48, declined to specify why the station dropped him, but said, "I think things will be fine." "This is always a dynamically changing business," he said, "and sometimes things do change and you have to roll with it." Ronan joined Belo8 in August 2003 and had a story on the station as recently as Friday's 10 p.m. newscast. It was about marathon runners no longer being allowed to wear iPods and other listening devices while racing in either the Dallas White Rock or Fort Worth Cowtown events. 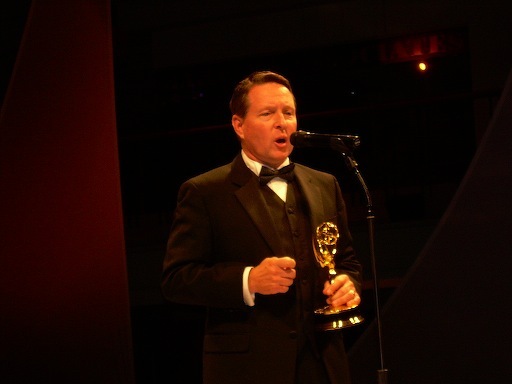 He recently won a Lone Star Emmy award at an Oct. 27th ceremony in Dallas. Ronan had been a general assignment reporter for Belo8 after previously working at CNN and WAGA-TV in Atlanta. He won three Emmys overall during his four years at Belo8.